Where to start? 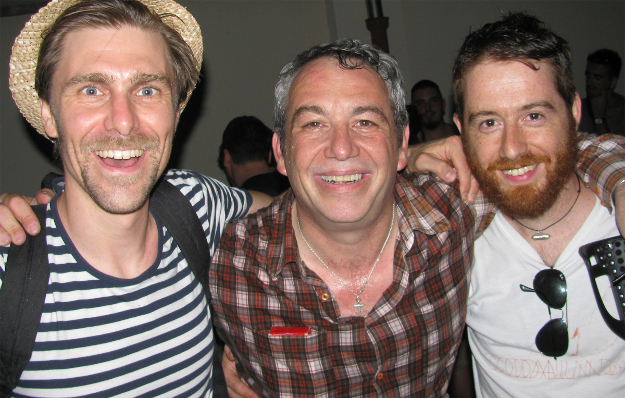 February began, as I wrote last time, with my interview with punk rock legend, and my musical hero, Mike Watt. You can read the whole thing here on Thumped if you’ve got a spare half-hour. I finally, properly met the man himself at the Il Sogno Del Marinaio gig at Whelan’s earlier this month, which was a great night only marred by the last support band and their truly horrible fans (all I’ll say on that note is: kids, don’t do drugs). Also on Thumped since my last update are my reviews of Baptists’ Bushcraft, the new one from Botanist, Darkthrone’s The Underground Resistance and the Relapse debut from Inter Arma. Meanwhile over on Burning Ambulance there’s my review of the new Cult of Luna, and another I wrote recently on the discography of Indian death-doom band Dying Embrace should be online soon. In other news, Pole Star was completed more-or-less on schedule (only a day behind!) at the beginning of March, on the same day I went to see Rotten Sound tear up The Pint. Arseholes in the moshpit aside, that was a remarkable show, made extra memorable by a strong support set from Enabler (Martyrdöd I didn’t dig so much but that’s just me). Equally happening was the Rest album launch gig at Whelan’s on 11 February; the late start was annoying, but the band put on a hell of a show – and I picked up a copy of their gorgeously packaged double LP for next to nothing. Getting back to Pole Star for a moment, I’ll have another update once I know when the presses are rolling. I don’t have any other big projects of that ilk lined up as yet, but it’s fine. Baby steps. Speaking of steps, I made a lot of them on St Patrick’s Day when I did the Harbour 2 Harbour walk in aid of Aware. That’s right: I walked the 26km around Dublin Bay from Howth Harbour to Dun Laoghaire in 4 hours 5 minutes (plus 35 minutes for sock-change pit stops), which I think is pretty good going, especially since the weather was so miserable, and I’ve never done anything like that before. My feet didn’t even get too blistered! Just to prove it to myself, I tracked the walk route with Walkmeter as I went, so I can look back and remind myself of what I’m capable of. And more importantly I raised an incredible €185 for a very good cause, thanks to the kindness of family and friends. By the way, you can still sponsor me for a couple more weeks if you missed out before. You were reading Weeknotes #595-601, a blog entry by MacDara Conroy. It is filed under Self and Weeknotes and was published in March 2013. If you liked what you read here, you can follow this site on Twitter @MacDaraBlogs or via reader feed, and find many more entries in the Archive.